Criminal politician Fiona Onasanya has begged voters not to kick her out as an MP despite being jailed over a speeding charge plot in a bizarre online video. The former Labour politician defiantly protested her innocence in a two-minute address shot in front of a backdrop of the New York skyline, saying she would remain as the MP for Peterborough ‘as long as you wish me to do so’. The 35-year-old solicitor was jailed for three months in January for perverting the course of justice but was released after serving one month behind bars. She is now facing a recall petition that if passed by enough constituents would force a by-election, after the Court of Appeal said her conviction was correct. Begging voters not to be thrown out of her £77,000 job, she said: ‘Now I have this opportunity, I would like to ask: people have asked for my resignation but what would you do if you were innocent? ‘Would you sit back and accept it? Would you accept it knowing in your heart of hearts that you are innocent? ‘Or would you fight to clear your name? I am telling you I am innocent and I will continue to pursue avenues to clear my name. It is not the first time Ms Onasanya has tried to claim her innocence. After her conviction she sent a WhatsApp message to parliamentary colleagues likening herself to Jesus and Moses because of her ordeal. Onasanya submitted an appeal against her conviction, but it was thrown out by judge Sir Brian Leveson at the Royal Courts of Justice earlier this month. That decision allowed House of Commons Speaker John Bercow to begin the formal process for a recall petition, which will allow her constituents to trigger a by-election if more than 10 per cent of local voters sign it. The recall petition will be open for six weeks from March 19 until May 1. She won the seat in the 2017 election with a narrow majority of 607, after defeating the Conservative incumbent Stewart Jackson. 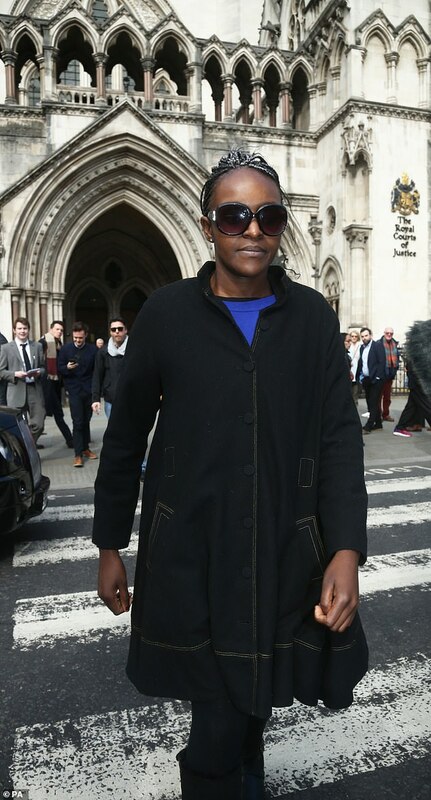 At the trial in December jurors at the Old Bailey were told that Onasanya colluded with her brother Festus after her car was clocked speeding at 41mph in a 30mph zone in the village of Thorney, near Peterborough, in July 2017. Labour threw her out after she was convicted and she has sat as an independent ever since. But Parliamentary rules dictate that only MPs jailed for 12 months or more are automatically forced to step down. In the video Onasanya claimed she had not been given a fair chance during her trial because of 'media spin'. She claimed 'my defence was never put across in the media' despite strict rules that ensure that criminal trials are reported fairly. She added: 'All of this time, I have not been able to share my side. But just like a coin has two sides, so does a story. 'And this is my time now to share with you, without media spin, what my side of the story is. Onasanya may struggle to convince voters to back her however. A YouGov poll carried out in January afters she was jailed found that 81 per cent of people thought she should resign as MP. Just six per cent wanted her to carry on as an independent.